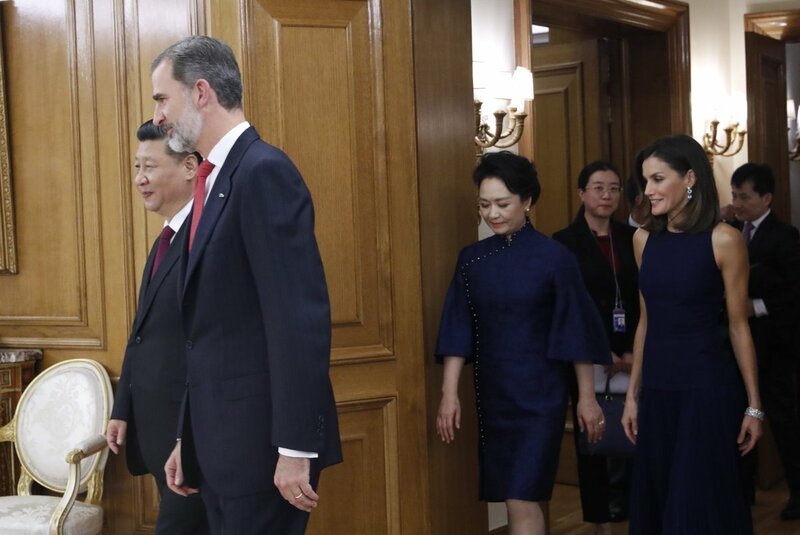 Today, King Felipe and Queen Letizia of Spain welcomed Chinese President Xi Jinping and First Lady Mrs. Peng Liyuan at the Palace of Zarzuela in Madrid. 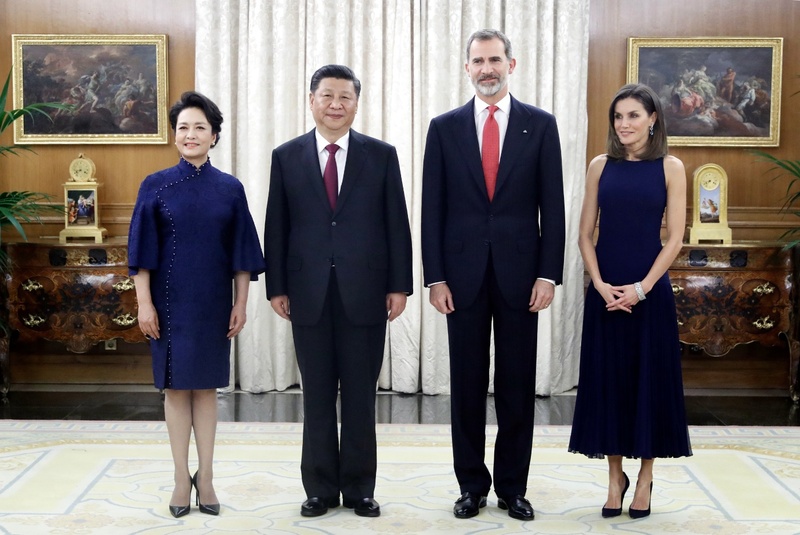 The royal couple hosted a private dinner for Chinese couple who is on 3 days state visit to Spain. Before the dinner, Felipe and President attended a diplomatic meeting at the Palace. 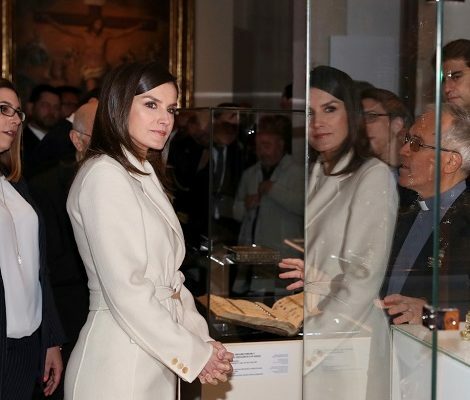 For the private dinner, Queen Letizia brought back a familiar look. 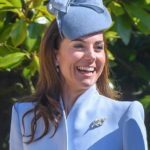 She wore blue Felipe Varela dress that was first seen at XXVI Princess of Asturias Concert Awards in October 2017. 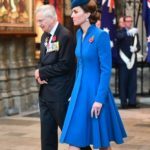 The peacock blue gown gave a vibe of ballroom gown. The sleeveless midi dress featured a fitted bodice, round neck, drop-waist and a flared pleated skirt and buttoned back. 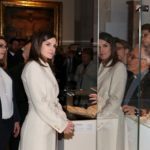 A look at Letizia wearing the dress in 2017. This time Letizia paired the dress with Bvlgari Aquamarine diamond earrings that were gifted to her at the birth of her elder daughter Leonor by the company. 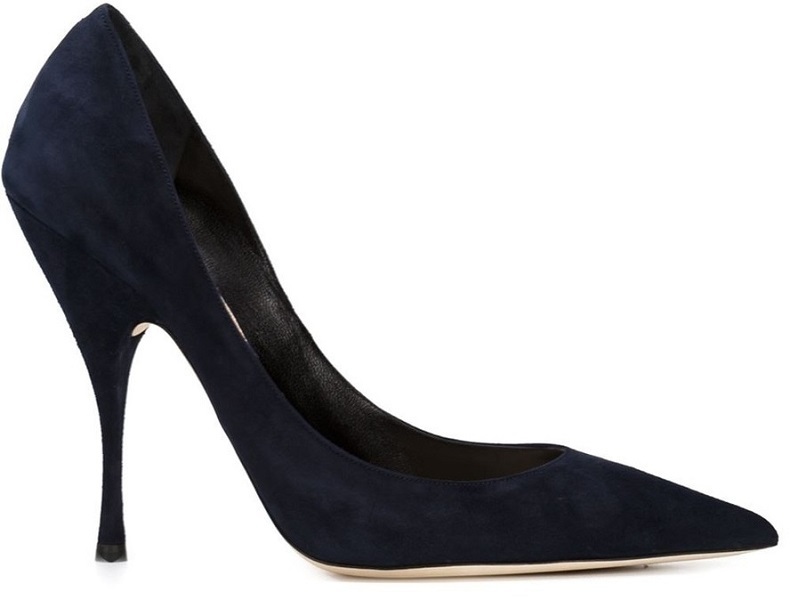 She was wearing Nina Ricci Suede pumps that have been part of her wardrobe for a long time. The dazzling element of the look was her Cartier twin bracelet. The joyas de pasar diamond bracelets are part of Queen Victoria Eugenie of Spain’s collection that has been passed on to the Spanish Queen. 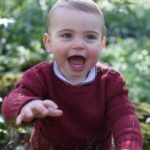 On Wednesday , an early reception will be hosted at the palace in the morning. Later in the day, Queen Letizia and Mrs. Peng Liyuan will visit the Royal Theater of Madrid. In the evening a gala dinner will be hosted at the Royal Palace in the honour of President and First Lady.